Pictured, from left, Metro CEO Art Leahy, Los Angeles Mayor Antonio Villaraigosa, Glendale Council Member John Drayman, Glendale Mayor Pro Tem Laura Friedman, Board Chair and Glendale Council Member Ara Najarian and Glendale Council Member Dave Weaver. 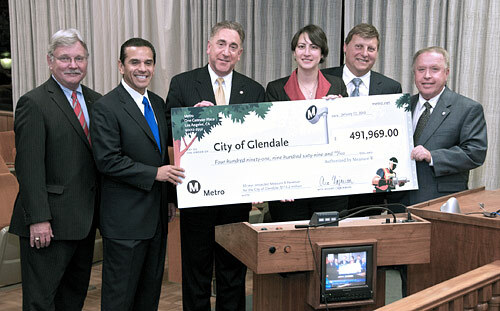 At the Glendale City Council meeting Jan 12, Metro Board Chair Ara Najarian, along with Mayor Villaraigosa and agency CEO Art Leahy, presented a ceremonial check to council members representing the first installment of Measure R sales tax money for use in improving transportation systems in Glendale. Glendale received $491,969 in funds collected through December 2009 from Measure R, the half-cent sales tax approved by Los Angeles County voters in 2008. As part of the measure, local cities within LA County will receive 15% of the funding to use for major street resurfacing, pothole repair, improving traffic congestion, bikeways, pedestrian improvements, signal synchronization and general transit improvements. During the presentation it was noted that Measure R is expected to generate approximately $40 billion over the next 30 years, with the City of Glendale expected to receive $113 million for various transportation improvements it chooses to make.